Ring out the old! And this year we can bid farewell to 2015 with an actual moth rather than reminiscences of past triumphs or disasters in the trapping field. 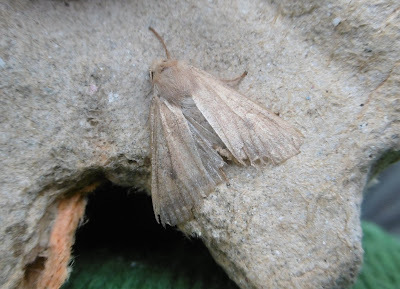 There seemed to be nothing in the eggboxes when I picked them out one by one after shining the lamp throughout yet another of this December's exceptionally mild nights; but as I put them back again, I spotted this Pale Brindled Beauty asleep on a side panel (above). 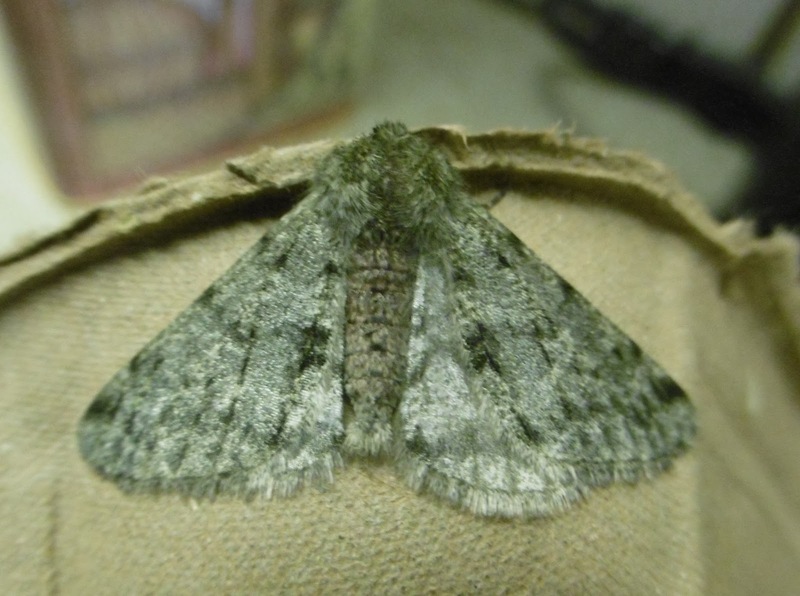 It is a lovely moth and this one is playing the calendar by the book - the Moth Bible suggests that although its official time on the wing is January to March, examples may sometimes be found in late December. Having said that, this year has notoriously rewritten the rules in terms of climate and you may recall that a startlingly battered Pale Brindled Beauty visited me on the night of December 7/8th. Nothing is surprising in current circumstances which have daffodils about to bloom in the garden and primroses, cowslips, roses and even geraniums all flowering happily away. I would normally put the trap away for a month or so now, but the weather and Nature's response are so intriguing that I plan to carry on for a while. Rain permitting. As you will doubtless have read and seen, the UK is suffering the misery of widespread flooding. We have been spared up to now, but it only needs the Atlantic storms to track a little further south for our defences to be out to the test. Like compatriots further north, there is little we will be able to do if the rainfall is as far above average as they have experienced. But I do have confidence in one piece of protection. 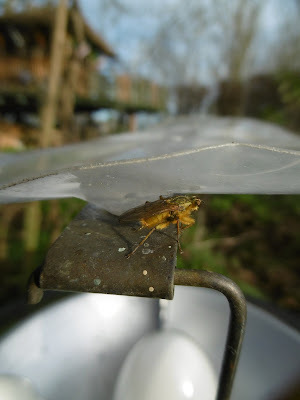 The deceptively simple rainshield on my Robinson Trap (famously designed by Mrs as well as Mr Robinson and I bet she was responsible for the shield, women being generally so practical) is extraordinarily efficient. 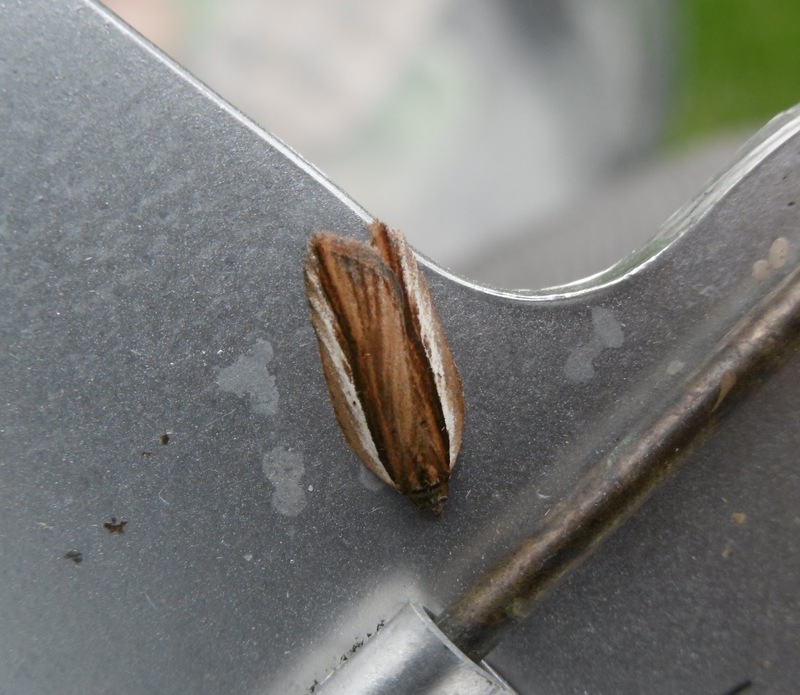 The picture below shows how little water seeped into the trap after a night of steady rain last week. Am I a moth? Or a butterfly? 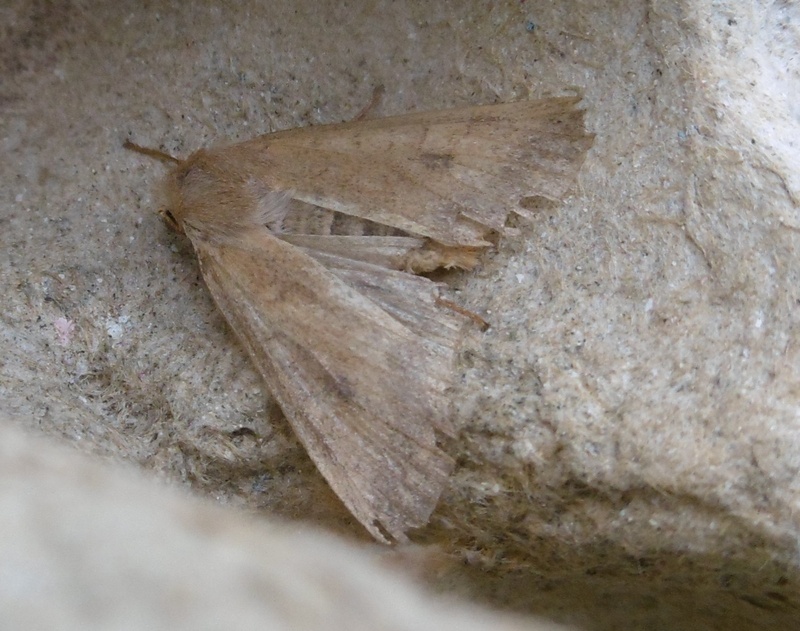 The trap is a lonesome place these late December nights, in spite of the unseasonal mildness of the weather. 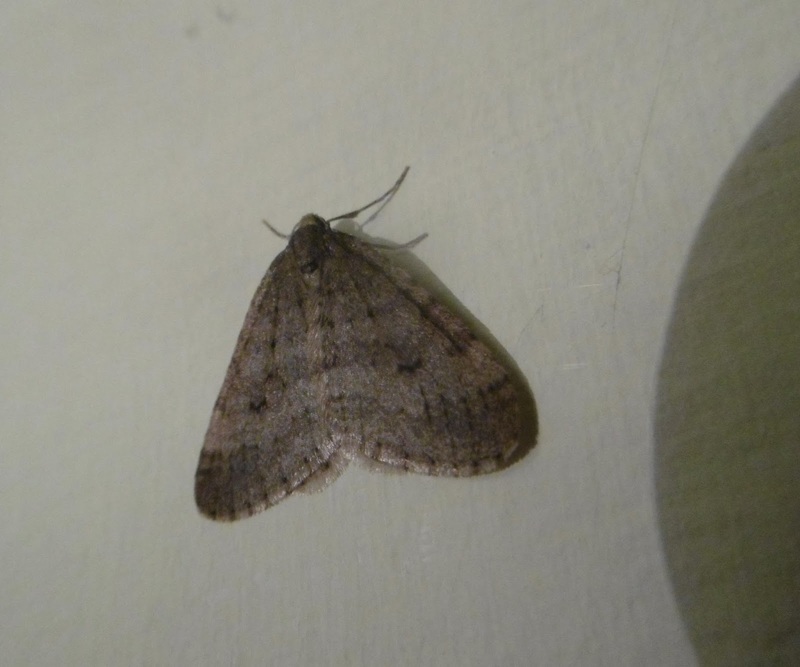 Here is last night's only guest, a Winter Moth; but a Winter Moth which provided some interest. Look! 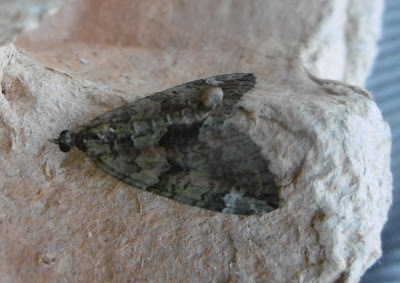 It is holding its wings in the 'butterfly position', vertically above its back as opposed to the official 'moth position' which has them folded over the spine. This is not uncommon among the more delicate moths, Carpets especially, but I have seldom found a moth so tenacious in holding the position as this one. I moved it from one eggbox to another, then from one finger to another. I teased it, prodded it, sang to it - all in vain. 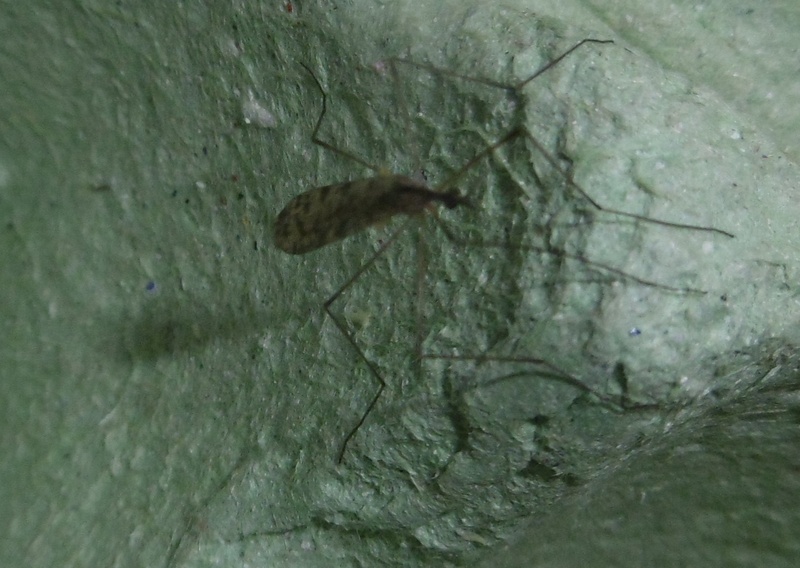 It held its misguided stance until the moment that it took off and fluttered away into the protection of our honeysuckle. "I'm a butterfly!" I felt I could hear it saying. "I'm not a moth." I say that the moth was alone but this was only true in terms of other moths. The eggboxes are very flyblown at the moment, diptera of all sizes and shapes squirming around in the cones. 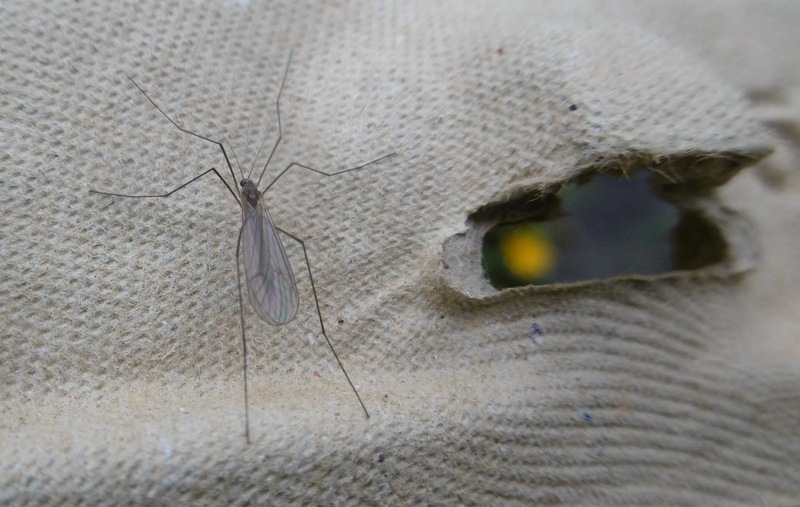 There was also this rather fine specimen, above, perched on the rainshield. In case you are wondering about the blur in the background, that's my granddaughter's treehouse. 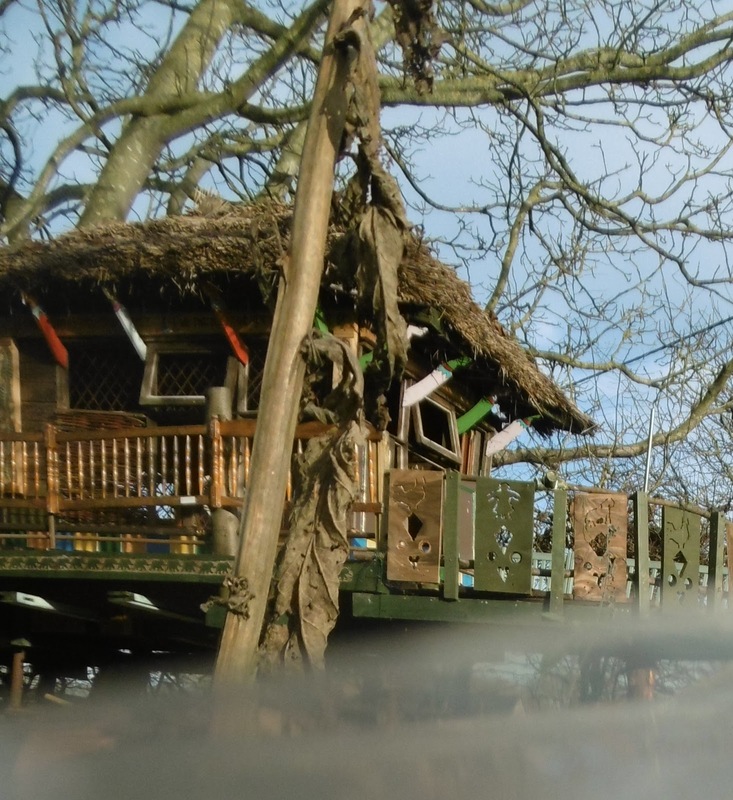 I append a properly focussed glimpse of it to the left. 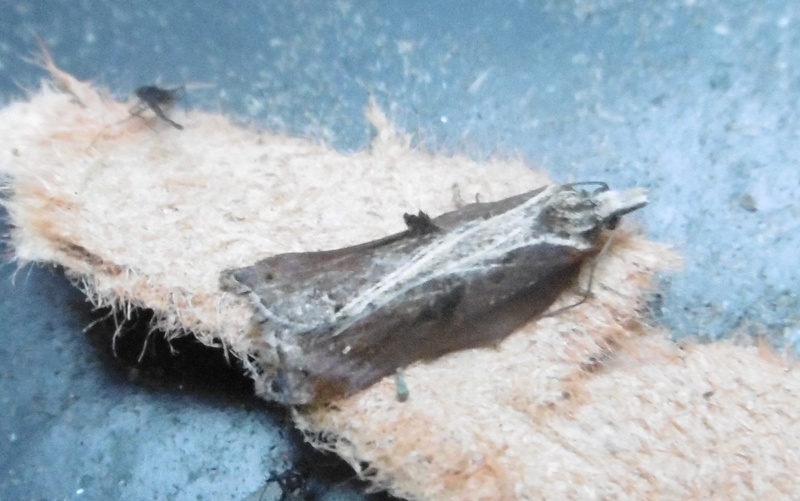 We had one of those eccentric pre-Christmas evenings yesterday when we slipped out of a seasonal show because we were falling asleep, went to a Chinese where we got two identical fake moustaches in our crackers and then came home to find a very pretty moth on the doorstep. 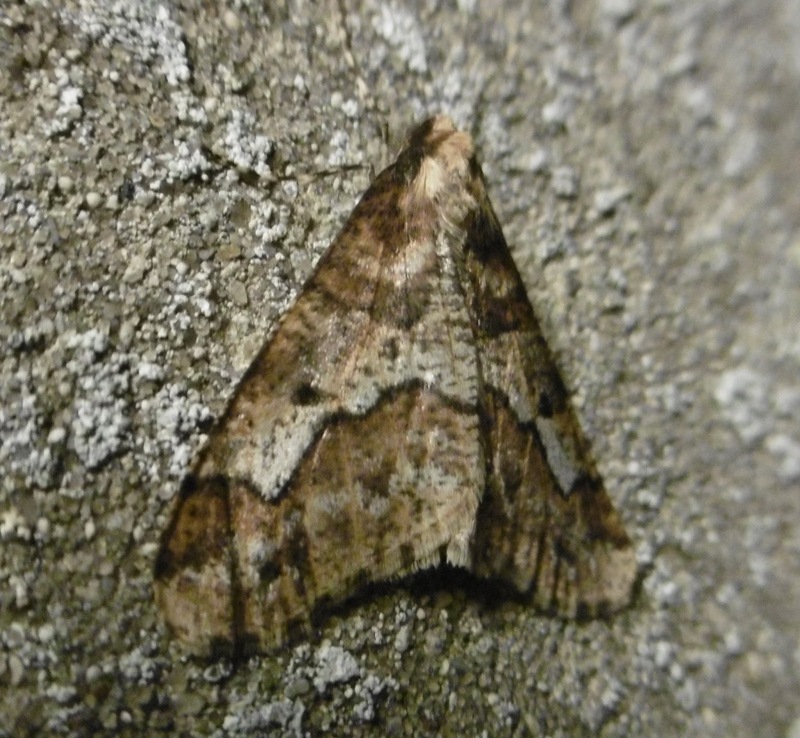 It's a Mottled Umber, a species whose disgraceful discrimination between the sexes formed the basis of my recent rallying call to feminists on the blog - click to remind yourselves here. 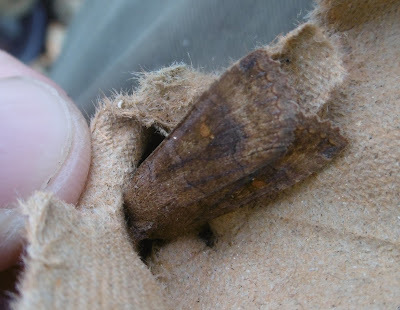 This moth is around all winter and the males come to light regularly, as this one did. He's at the top end of the decorative scale. 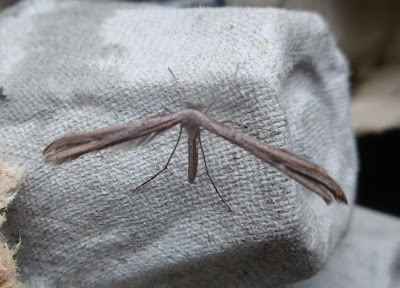 The wing pattern and colour varies and some are an almost uniform beige. The trap itself was empty this morning and I may rely on the porch light for a while. 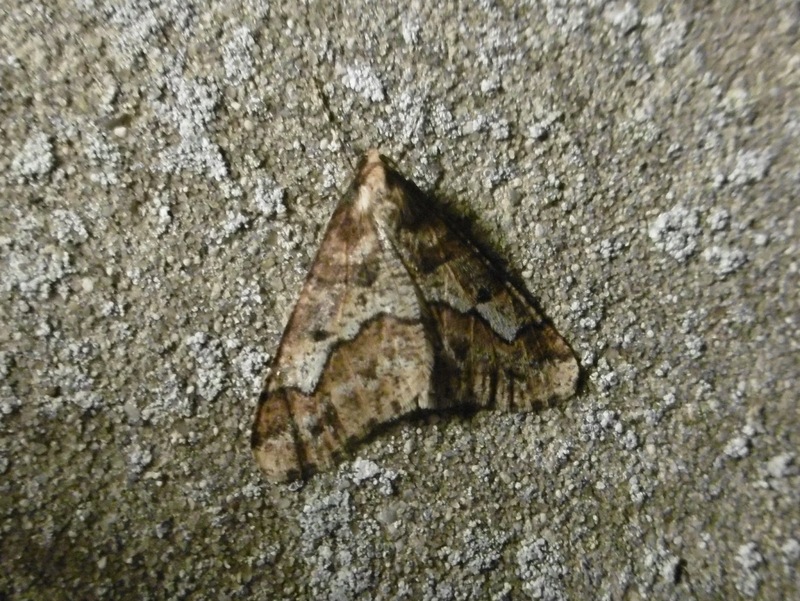 But the extraordinarily mild nights are a temptation for putting out the full works, and there are reports of Saharan winds blowing unusual moths this way, so watch this space. This snazzy little micro was snoozing on the trap's bulbholder this morning, an excellent place to pass the night. I photographed him or her very shortly after turning off the light and the warmth of the bulb was still sufficient to give my hands a pleasant warming. It must have been like the Rivera for the moth. I thought that I would identify such a distinctive creature immediately from the Micro Moth Bible but I couldn't see its exact equivalent there. 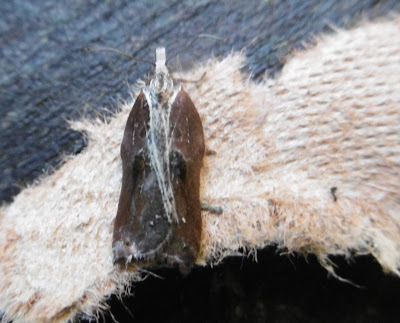 I found it, and the explanation, when I tried the very good website UK Moths, which showed exactly this type above a note that the species - Acleris hastiana I am all but certain - is almost as variable as its somewhat scarcer relative Acleris carcana which visited me last week. 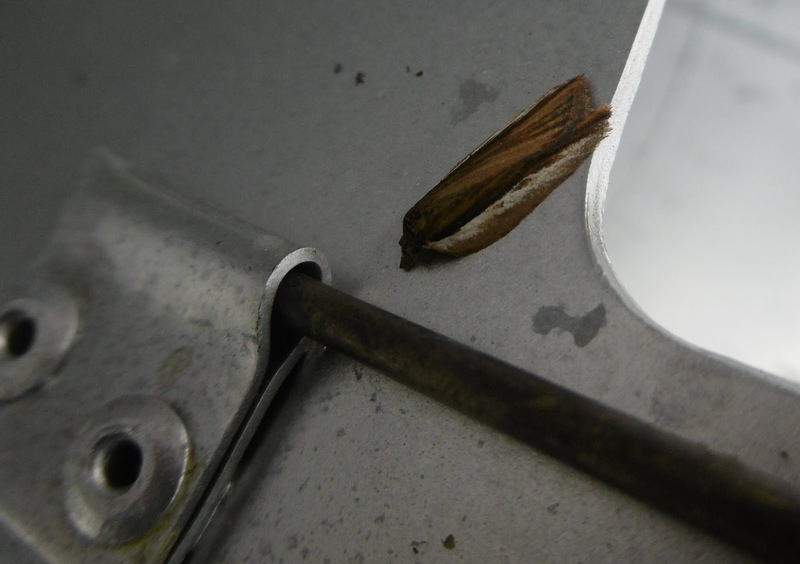 I like it when the moths use other parts of the trap to rest, because the effect is like something out of Star Wars. 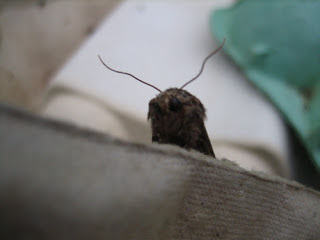 May the Force be with all moths. It certainly seems to be this super-mild December. 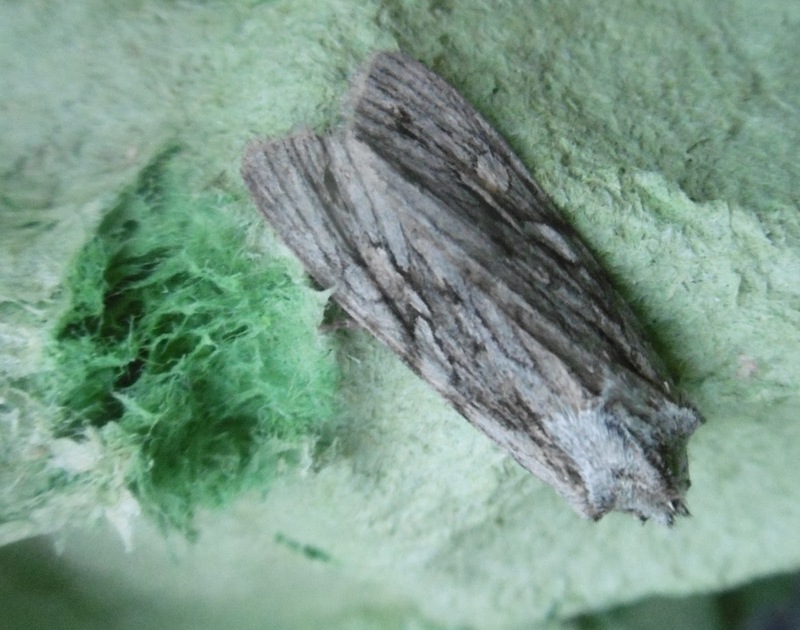 I gave the trap a good scrub yesterday and put it out last night because - in spite of the snow picturesquely decorating Scotland and the Angel of the North at Gateshead - conditions continue very mild down here. Neighbours have also reinforced my eggbox supplies, replacing damp or broken fragments which have hosted the moths for too long. But this morning..? 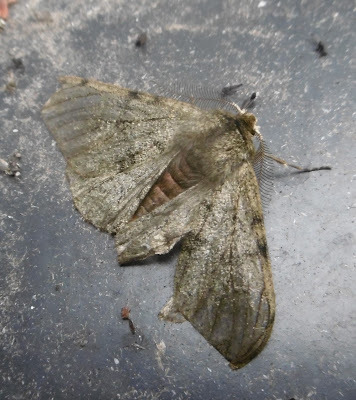 Nothing in the way of moths, a salutary reminder after last week's modest excitements that this really is the dead time of year. My pictures show, however, that small winged creatures are nonetheless on the move. 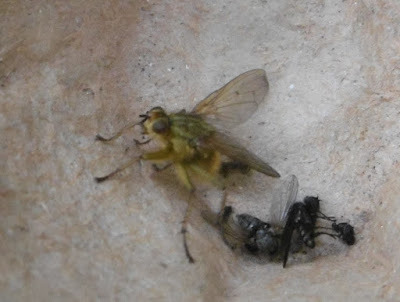 Should a dipterist be passing, such as that excellently cheerful woman who promotes flies on Radio 4, I would be delighted to know what they are. 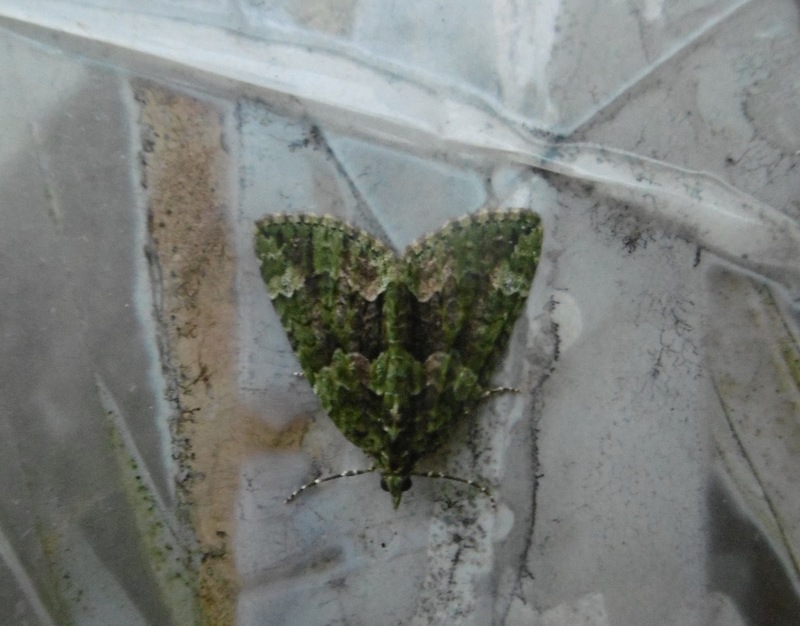 This modest little visitor to our porch windows last night is a very interesting moth. 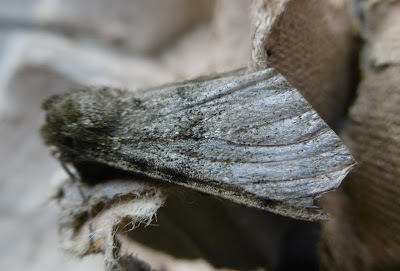 Given the time of year, you will not be surprised by its name: the Winter moth, although I think that this particular one may well be the very closely related Northern Winter Moth (found commonly outside the South West in spite of its name). 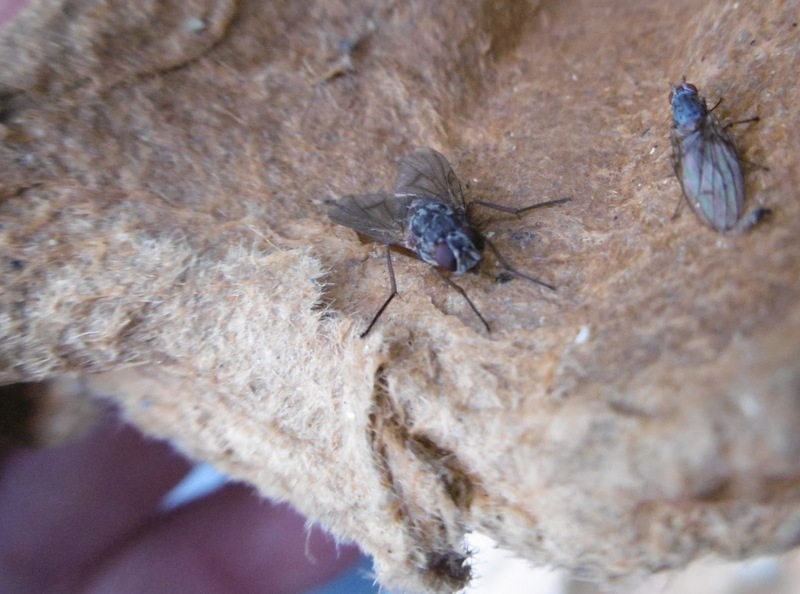 Both species have an extraordinary ability not just to survive cold temperatures but to fly in them. 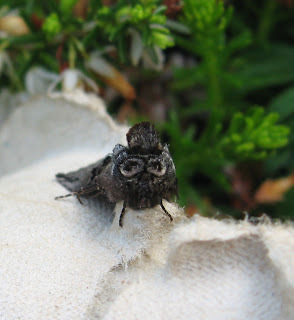 Four years ago, I noted how the 2011/12 brood in Leeds had just come happily through a spell of temperatures as low as minus 12C (10.4F). This year's are having it easy, for now. 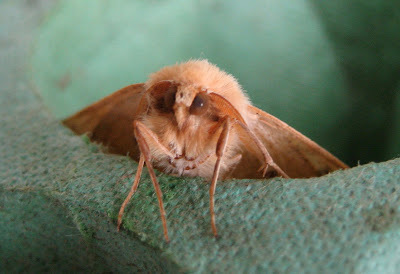 The moth uses a sort of natural anti-freeze in its blood to keep active, although its procedures for setting out on an evening flight resemble those of Russian lorry drivers in Siberia who light fires beneath the engine to warm things up. The moth flexes its wing muscles at a gradually increasing rate for up to half an hour. Once this exercise has raised its internal body temperature to 30C (86F), the moth is ready for take-off. So that's what lies behind its otherwise unremarkable presence on our window pane. A lesson worth recalling when you meet someone who doesn't initially appear to be very interesting. It is true that you never get a second chance to make a first impression. But first impressions can deceive. Keeping the lamp alight on these damp and coolish evenings continues to bring dividends, albeit in very modest amounts. My latest arrival is a micro-moth which I have long hoped-for, Acleris cristana which I privately consider to be the Lizard Moth. 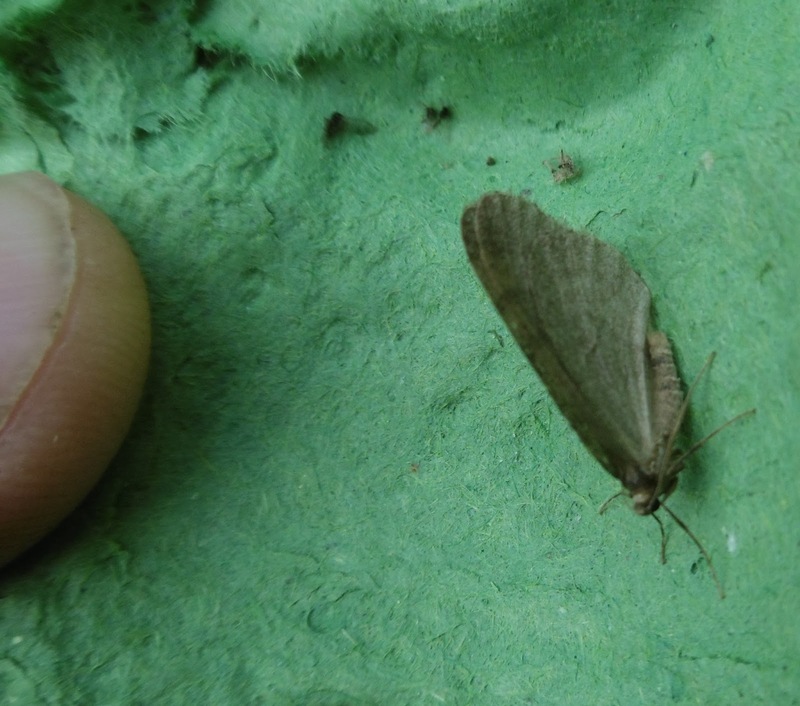 My own photographs do not do the coining justice, but if you look at the illustrations below from the Micro-moth Bible, you will see what I mean. Each looks, especially the one in the middle, as though I tiny lizard or eft (the appealing word for a baby newt) is crawling up its back. I very nearly missed the little creature. The eggboxes appeared to be empty and the night had been cold. 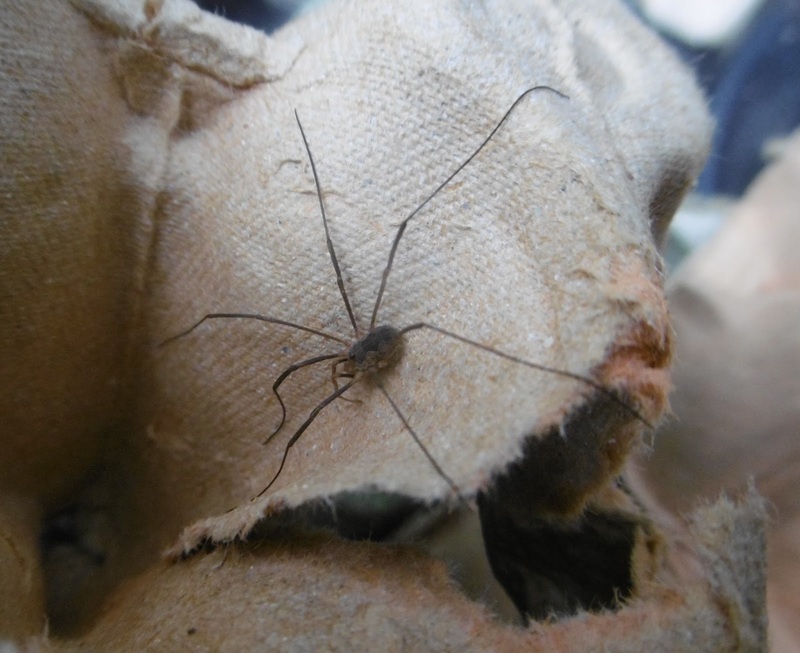 But just as I was turning over the very last one, it scuttled out from underneath. 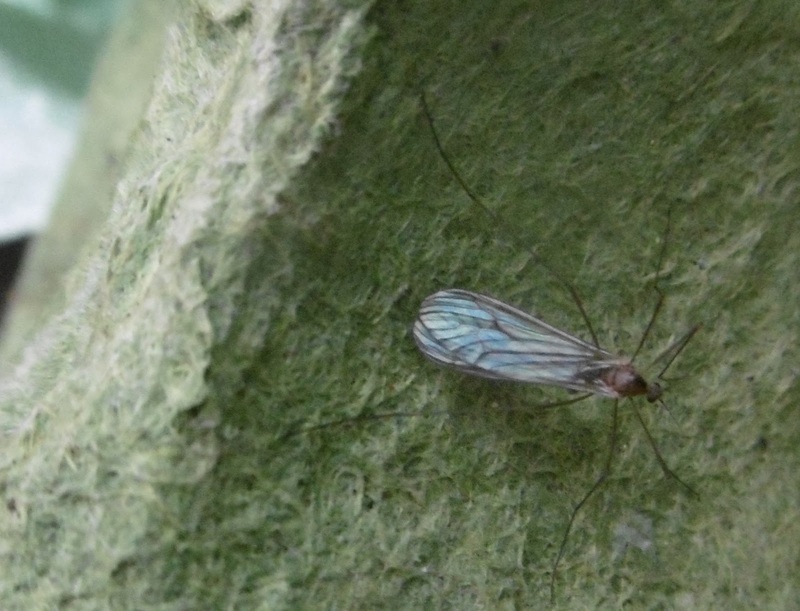 Micros can be very flighty but I managed to tempt it on to a fragment of eggbox for a brief photo session. Then I tried a sideways on picture and it took off. It must still be in our greenhouse somewhere, but the words 'needle' and 'haystack' come to mind. I wasn't entirely sure that it was cristana, as the main flying season is in the summer. 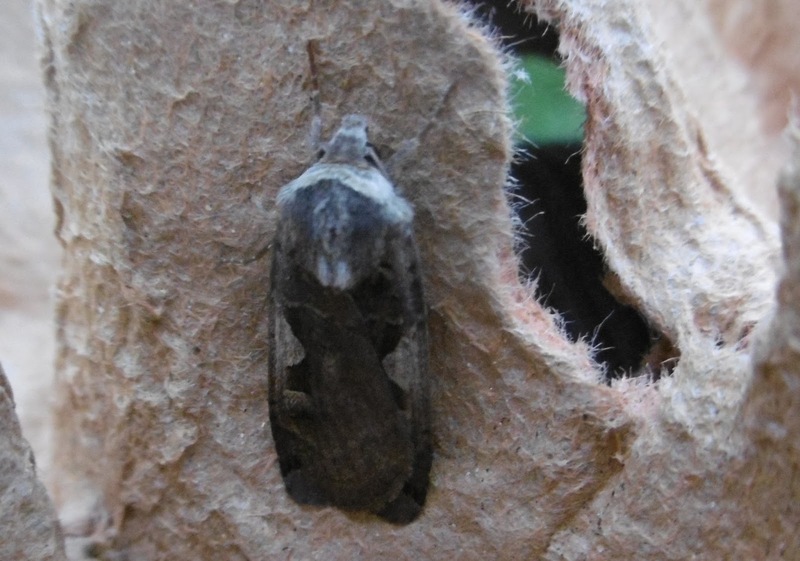 But the adult moths hibernate over winter and can be tempted out by warmer conditions or, it appears, by very bright lights. A curiosity of this moth is its number of large (relatively speaking) tufts of scales on its wings, a shown in the example on the right in the Moth Bible picture, and just visible in my specimen below. 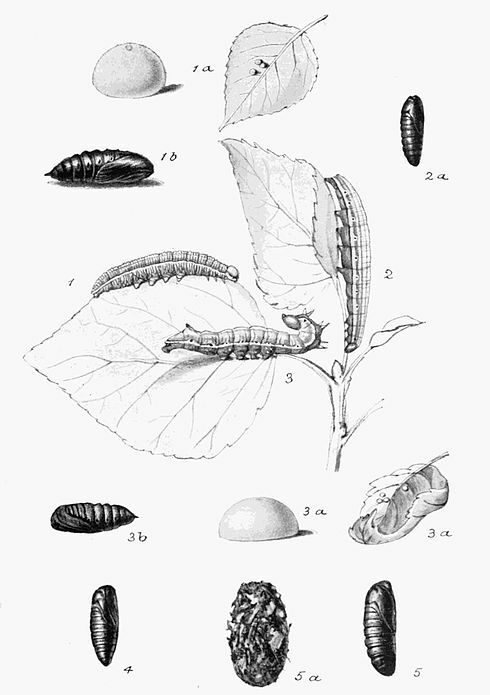 What these are for and why they have survived evolution, scientists do not know, but the fact that cristanas without them are found regularly suggests that, like humans' tails, they may be becoming obsolescent. Cristana is also one of the most variable moths in the UK, with no fewer than 137 different forms described in mothing literature. There is much discussion in the moth-enamoured world about when - or even if - we are going to have a winter this year. A sort of continuous Autumn seems to have set in, with the result that all sorts of species are about which shouldn't properly be, and vice versa. Today's moth is an example. I couldn't make head or tail of it to start with, and not just because it's in such a battered state. 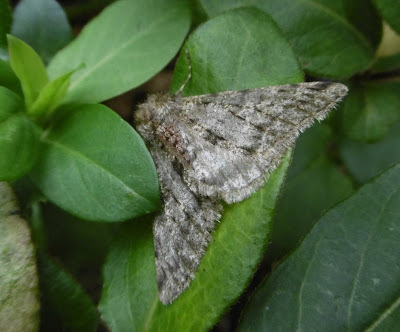 But scanning the Moth Bible and inspecting the resting posture, wing shape and body colour, eventually convinced me that it must be a Pale Brindled Beauty. 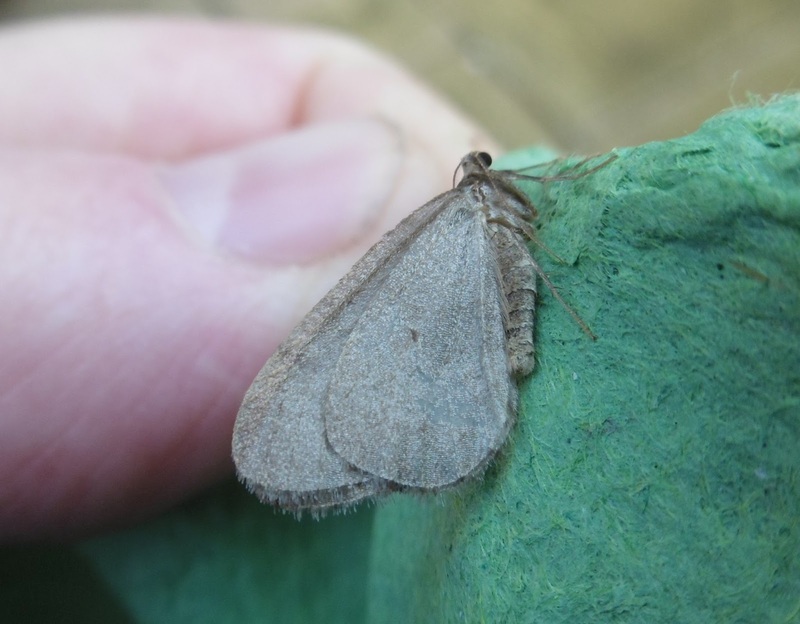 Dave Wilton on Upper Thames Moths has confirmed this, and added that the moth's tatty state is interesting 'so early in its life'. 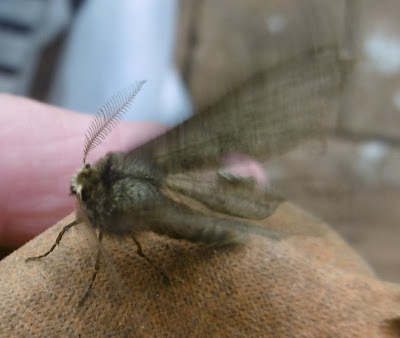 He says this because the PBB is a moth which is usually on the wing from January to March, with only occasional examples found in late December. 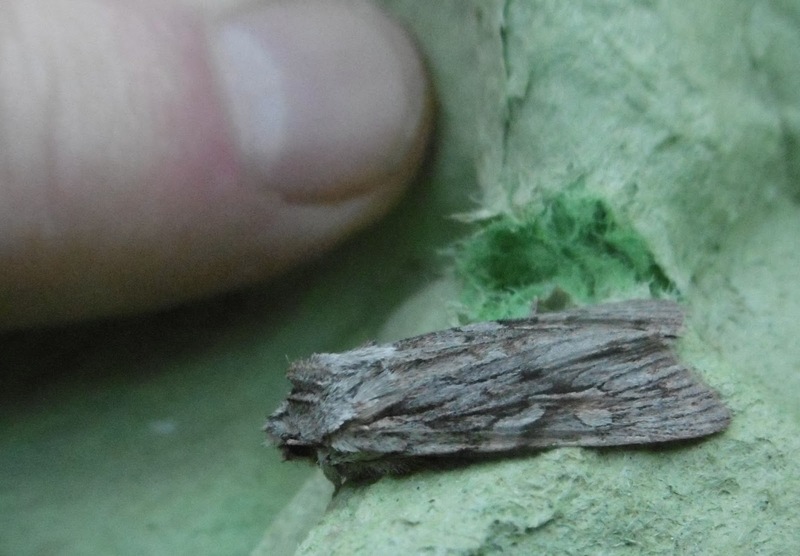 Yet here we are in early December, and here is a Pale Brindled Beauty which has clearly been around. 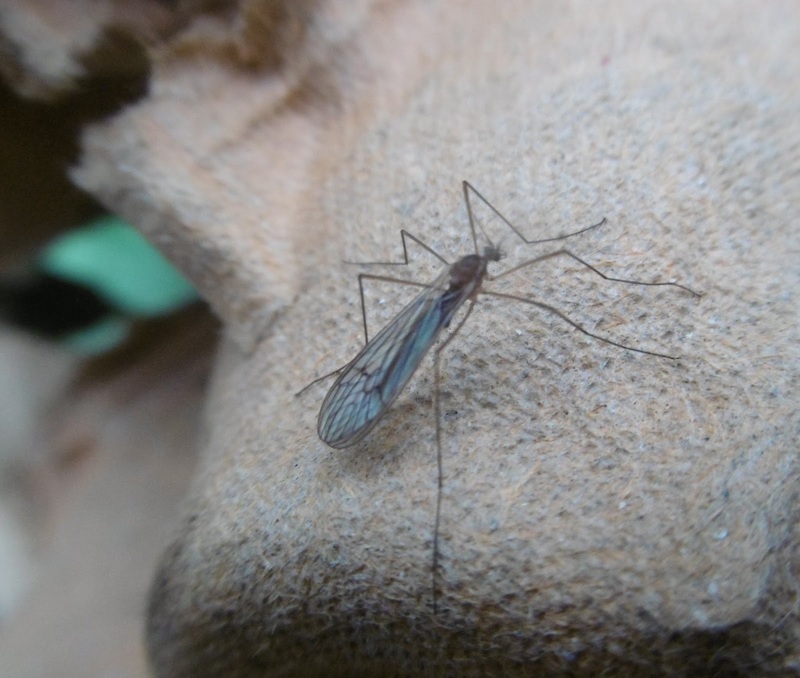 It is a male mind you - only the males have TV aerial antennae like this. So - bearing in mind yesterday's gender discussion here - maybe it's got itself into some kind of lads' fight. It still had plenty of spirit and shortly after I teased it into showing its antennae, it whirred its battered wings and flew away. 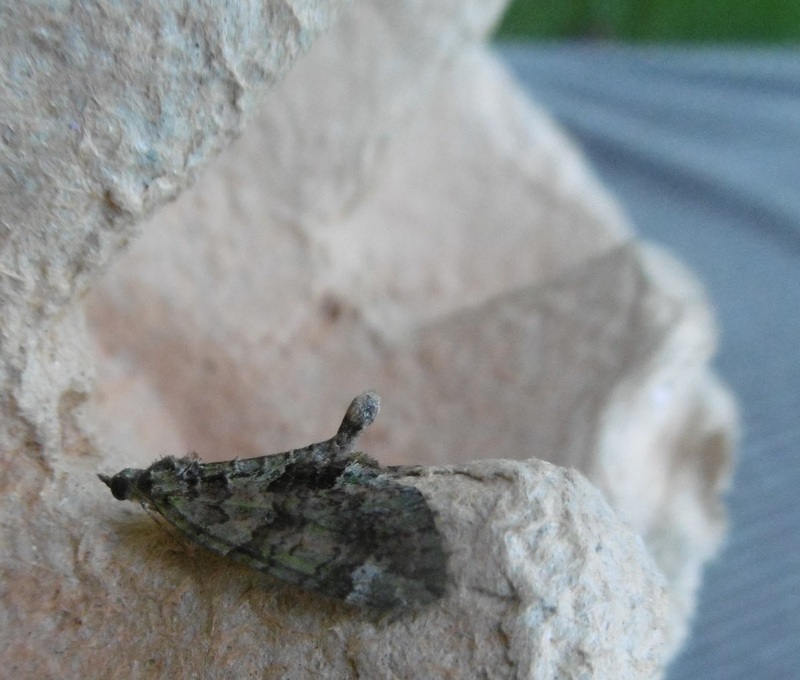 There was only one other moth in the eggboxes: this Common Plume below. 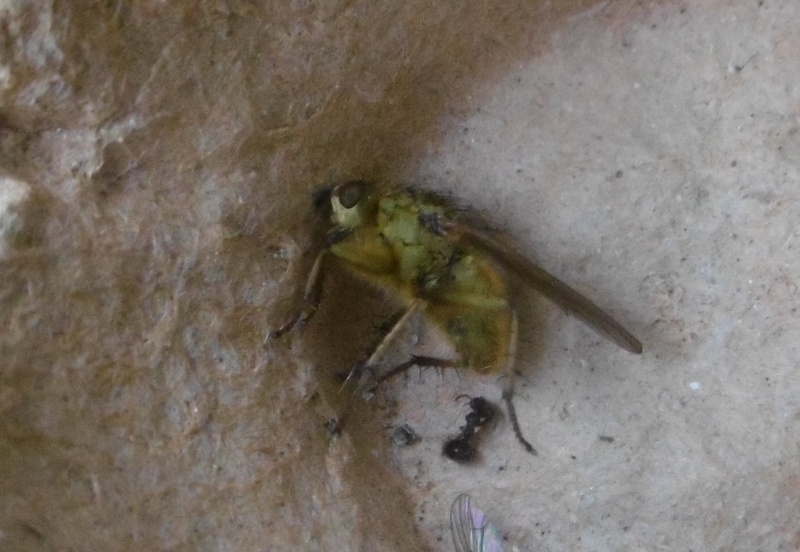 Its Linnaean name is Emmelina mondactyla which I translate as Emmy Monoplane. 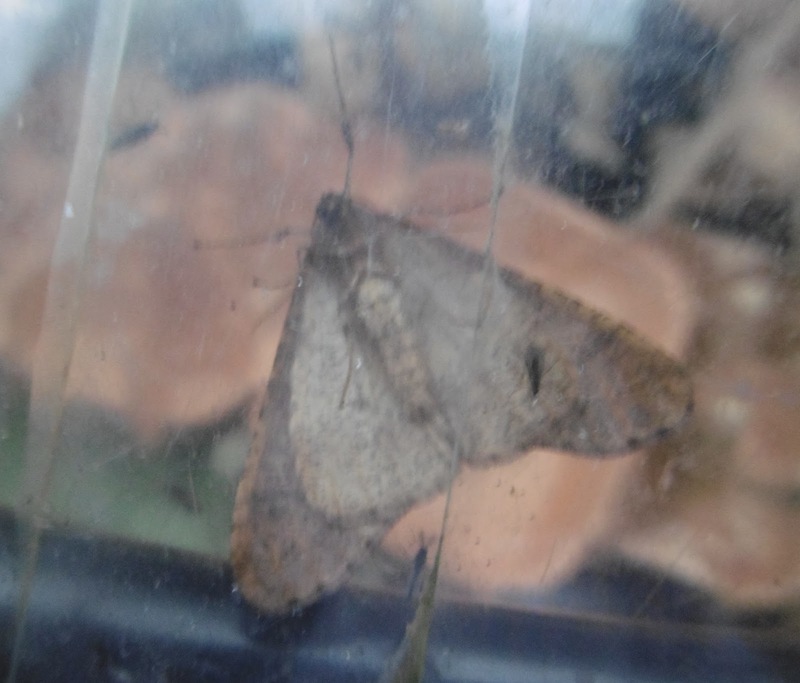 The moth trap had its first December outing last night, courtesy of six-year-old Cassie who came to see us with her Mum and Dad and a friend. She pressed the switch after we decided that a mild, dry night was in prospect and that there was at least a chance of luring something to the lamp. Hey presto! A very nice moth was dozing on the transparent shield this morning - a Mottled Umber, whose curious gender arrangements may inspire Cassie in due course to take the fight for genuine equality between men and women a stage further. Why? 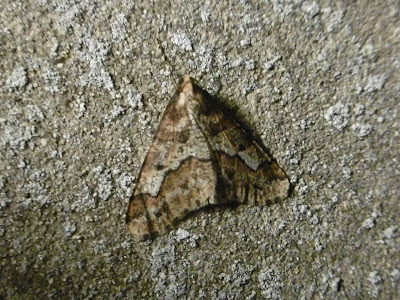 Because the fate of the female Mottled Umber is a sorry example of what can happen when things go the other way. 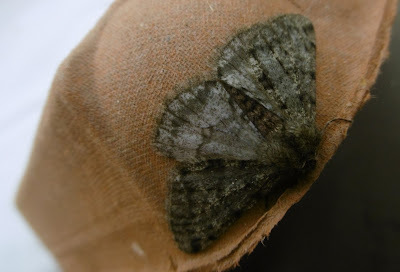 I don't suppose that it means much to moths and I don't hold what I believe are called Lamarckian views about animals being able to adapt evolution to their own ends. but my second photo is a sorry spectacle for us humans, isn't it? The male has no fewer than four different, handsome outfits. The female resembles a run-of-the-mill spider. The reason, if I understand it correctly, is that she is little more than an egg-laying machine, spending her life on tree trunks while emitting a pheromone which diverts the males away from their exciting life swooping around in the dark. (Actually, to be consistent in my evolutionary views, 'exciting' is probably a meaningless word for a moth, whose entire life system is devoted to avoiding bats and birds and finding a female with whom to breed. Still, my one wish of life which is almost certain to be unfulfilled, is that I might develop the ability to fly. On which score, check out a very good book, if you can find it, called The Flying Yorkshireman by Eric Knight, the creator of the screen dog Lassie whose promising career was cut short when he died in an air crash in 1943. To return to this blog's supposed subject, the other moth in the trap was also a handsome specimen, the Red-green Carpet shown in my fourth picture, above. 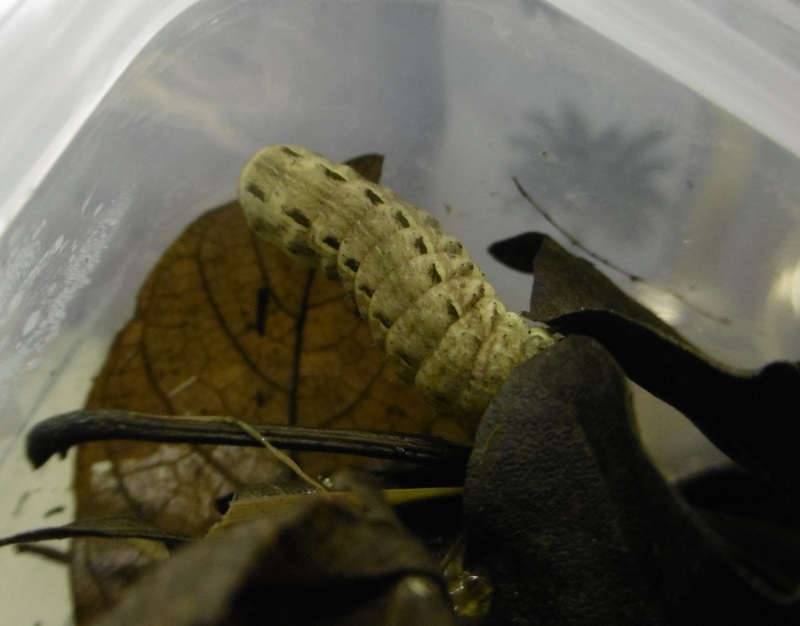 This brings happier news for Cassie and the women of the world: its life cycle in the UK depends on surviving the winter as an adult, but only the females can do this. The males aren't tough enough. All in all, a happy outcome to our decision to turn on the lamp - and Cassie has taken one of my Emperor Moth cocoons back to London. 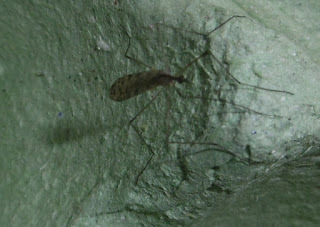 Let's hope we have news of a successful hatching in March or April. 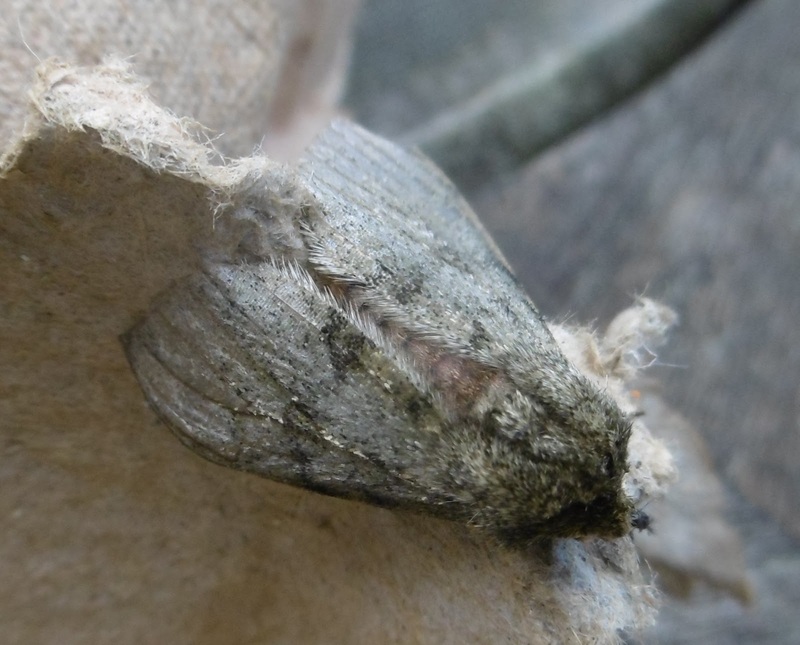 I suggested pupa-digging as a way of passing the time during the current dead season for moths - in which a Winter, November or December moth is about as exciting as things in the trap would be likely to get. 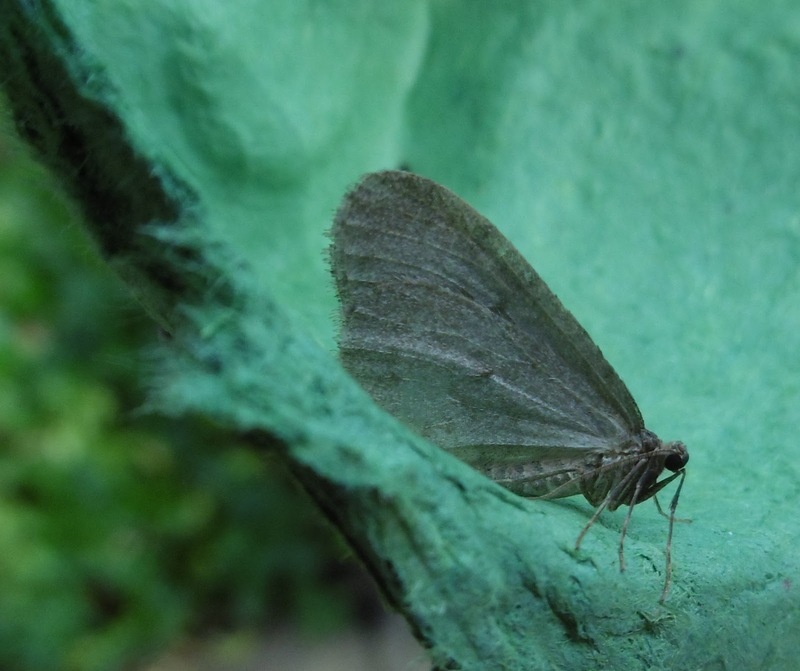 A less strenuous way of looking for moths - and butterflies - is to do a bit of Spring cleaning ahead of time. That's how I found the Small Elephant Hawk and Peacock in the picture above. Both are long-dead and partly decomposed - with interesting results fo any student of insect wing structure who might have had their attention caught by the membranes in the Peacock's damaged wing. It looks like a wartime aircraft returned from a mission with flak damage - an image which is sadly germane to the goings-on in today's wider world. 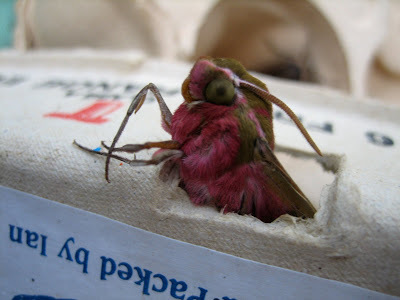 The Small Elephant Hawk is the second I've found dead this year. 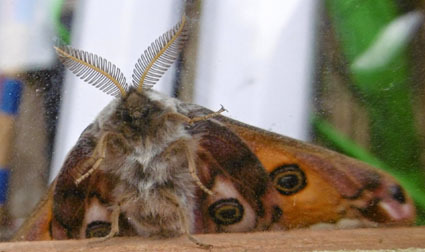 The Peacock is a much more common discovery, along with Small Tortoiseshells and occasionally Red Admirals, in nooks or behind furniture where dusters seldom venture. Be careful with these butterflies, though; many are not dead but sleeping, to emerge when the days get warm again. My leisurely pace of blogging at the moment belies my intense activity on the page - reached by clicking of the tab above - called 364 and counting - my records. I am listing all the moths which have visited me both in Leeds and here in Oxfordshire, with photos. I hope it may be a useful aid to others engaged in this absorbing hobby when sorting IDs for the insects they find. 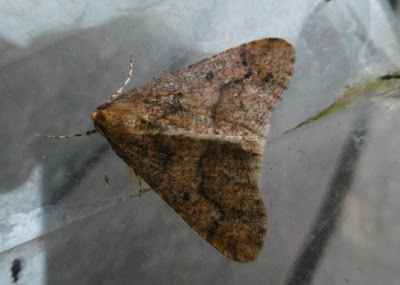 I've just reached the end of moths beginning with C tonight. Excelsior!